Rapid expansion of travel business is contributing in strengthening of the food service market across the globe. Vendors are now more focused towards operating food and beverages outlets across railways and airports. This is giving an edge to the food service business players to gain the contracts and maintain their strong dominance in the market. However, increasing minimum wage rates are becoming a major obstruction for the expansion for the food service industry. In 2017, as per Bureau of Labor Statistics, over 66% of the workers who are getting minimum wage or less are employed in food & beverage industry, mainly for service jobs. The chances of closing restaurants are increased by approximately 14% if there is a hike of USD 1 in their minimum wage. Although, increment in minimum wage is expected to turn out in a positive manner for the employees, but it will also increase the pressure on the food service industry to provide efficient and innovative services to the consumers. According to Goldstein Research, global food service market is projected to grow at the CAGR of 4.1% during the forecast period. 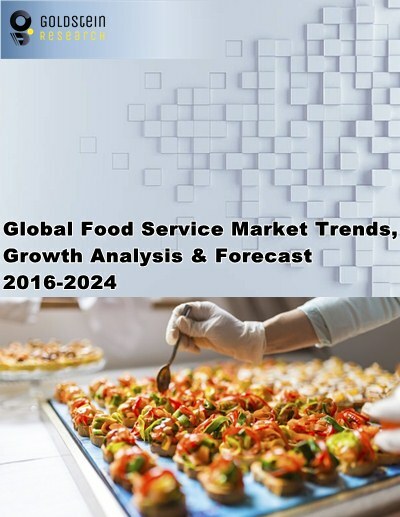 Global food service market valued USD 3.20 trillion in 2016. With the rising concerns of consumers over total number of calorie intake, demand for healthy meals and fresh quality food is also increasing. This is propelling the growth of food service market across the globe. Food services market is expected to witness steady growth in North America region during the forecast period. Saturation and stagnation in the food business in matured market such as the U.S. is creating stable growth of North America food service market. However, Asia-Pacific region is likely to dominate the global food service market over the forecast period. Rising economic development in emerging markets with increasing number of food outlets in the region are contributing in the growth of Asia-Pacific food service market. Asia-Pacific food service market valued USD 1.1 trillion in 2016 and is expected to witness robust growth during the forecast period. Changing food habits and preferences of consumers are pressurizing the market to innovate and customize their food menus as per the demand for consumers. Different priorities such as fresh and natural food with high nutrient content, adventurous meals with authentic and sophisticated services from users are creating market competitiveness for providing high value oriented food services to the consumers and thereby are expected to contribute in the expansion of food service business across the globe. Moreover, online food services and home delivery system provides the convenience to the users and thus increasing the business for market players. Rising number of independent restaurants and food outlets are also expanding the food service market. In 2016, in food service industry, over USD 200 trillion sales were contributed by independent restaurants. However, increase in number of independent restaurants is also becoming a threat for existing market players and leading food chains.